What the primary race is missing, so far, when it comes to women. As the 2016 presidential primary race moves on to Nevada and South Carolina, then to bigger states in March, let’s hope we’re leaving behind the tedious and divisive way both campaigns and their supporters talked to and about women. Let’s especially hope we’re leaving behind two of the most annoying features of the campaign to date: the so-called Berniebros preying on female Hillary Clinton supporters with, at best, condescension and, at worst, sexist abuse, and the hellfire from Hillary Clinton backers—we’ll play on Madeleine Albright’s unhelpful quote about the “special place in hell for women who don’t support other women”—insisting that female Bernie supporters are failing their sister Hillary Clinton with their terrible taste in men. 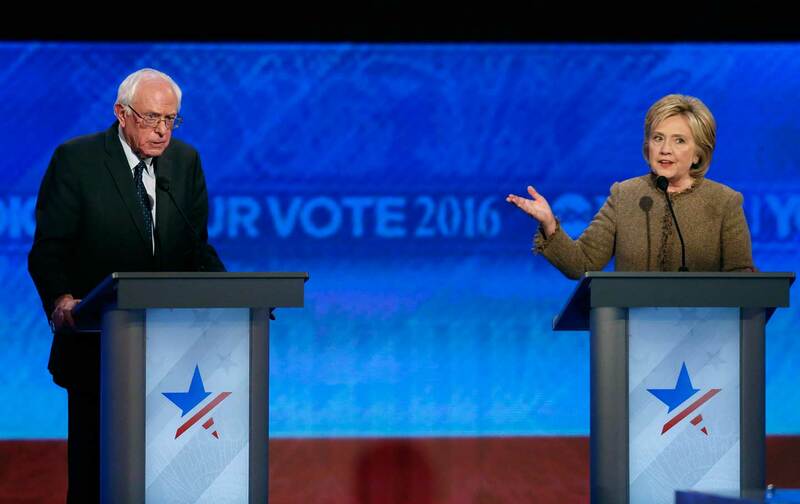 Both Democratic campaigns talked critically, condescendingly and annoyingly at women. Of course. What do both sets of attacks have in common? They’re both directed—critically, condescendingly, and annoyingly—at women. Of course. To his credit, Sanders has denounced his abusive keyboard-warrior fans who troll women with sexist invective. “Anybody who is supporting me that is doing the sexist things—we don’t want them,” he recently told CNN, echoing comments he made earlier in the campaign. That meant a lot—especially when some of his high-profile male media defenders, trying to gaslight the women who’ve been targeted by obnoxious pro-Sanders sexists, have insisted that Berniebros don’t even exist. It’s also interesting to note that since the Sanders campaign spoke up, the incidence of online abuse has gone down (as far as I can tell). Apparently the keyboard warriors are listening to their leader. But last weekend we saw the campaign’s messaging unravel thanks to three passionate supporters. Gloria Steinem, in a quote that’s been taken out of context, somewhat unfairly, lamentably claimed that “when you’re young you’re thinking, Where are the boys? The boys are with Bernie.” Former secretary of state Madeleine Albright spoke aloud, in the context of this campaign, the maxim so famous that it’s adorned Starbucks cups, seeming to condemn Sanders’s young female supporters not merely to the political margins but to hell. Finally, former president Clinton railed against the Berniebros and cited me by name, referencing the piece I wrote about the abuse I’ve taken from some of Sanders’s ugliest male supporters. None of that helped Clinton; it may have hurt her. I hope that condescending approach to women who support Sanders is behind us—but it may not be, because when the Clinton campaign is feeling cornered, misunderstood, and down in the polls, as in was in 2008, its worst instincts come out. The campaign has to learn from that loss; defensiveness never works, and attacking her opponent only reinforces the stereotype that she plays dirty (never mind that both Obama and Sanders gave as good as they got; they were insulated from attacks because they weren’t seen as mere politicians; they were judged to have transcended politics to become movement leaders). Clinton began to rebound in 2008 when she shook off her angst about media bias and campaign sexism and became a fighter again. She needs to do that this time around. In particular, Clinton has to look squarely at her dismal numbers with millennials to try to understand the desperation, and related distrust of politics, behind them. It’s absolutely accurate to say that Clinton’s negative numbers on honesty and trustworthiness have been driven by a 25-year “vast right-wing conspiracy”; but what’s done is done. Sanders is bringing in new voters who have little knowledge and no ingrained defensiveness about what Democrats have suffered at the hands of increasingly radical and politically vicious right-wing Republicans (and compliant media). Many have no loyalty to the Democratic Party in the first place. Democrats, starting with Clinton, must try to win their loyalty. Young women in particular have to be a Clinton concern. Women are always more “liberal” than men, and more pro-government, because they have always been more vulnerable to the unfairness of the market. The gender gap has been at least as driven by economics as by concerns about reproductive rights and gender discrimination—poorly labeled “women’s issues”—if not more so. On one level, then, it makes sense that young women are open to Sanders’s radicalism, and his appeal to a vastly expanded welfare state, providing free college, and single-payer healthcare financed by higher taxes. The Sanders camp ought to be a little more sensitive to the tens of millions of women who do support Clinton. As the mother of a millennial woman (albeit one who supports and works for Clinton), let me tell you, those are terrible messages. We have to drop them. But what should Clinton say instead? She isn’t a radical, and she shouldn’t pretend to be one. She does not believe in the rapidly and vastly expanded welfare state, financed by vastly expanded taxes, that Sanders promises. But she must cast her own progressive vision in much bolder terms than she has to date. She has decent reasons to oppose “free college”; first of all, it would crowd out most of the other new and expanded government programs she has proposed. Still, Clinton must feel the desperation of a generation saddled with student debt for whom “free college” makes absolute sense. When she said flat-out in the last debate, “No, I don’t believe in free college,” I cringed. There’s a tough, candid, but sometimes flippant side to Clinton—”That’s what they offered me,” in response to concern about her Wall Street speaking fees—that I respect. To me it’s like Cautious Hillary finally doesn’t GAF, as the kids say. But she has to GAF, lots more of them, about these issues if she wants to win. While I’m giving free campaign advice, I’d also advise her staff to schedule a lightly moderated town hall at a South Carolina university—maybe at an historically black college. I saw her speak at Claflin University, an HBCU, in November, and she shined. But it was a small crowd, and only a minority of the audience were students. In New Hampshire last week, Clinton reportedly took questions from college-aged Sanders supporters, which was a good idea—but almost nobody saw it. There’s no guarantee we’ll see it this time, but it’s worth a try, and if she goes big and bold enough, media invested in the idea that she can’t do it might televise the spectacle. What does Sanders have to do, on gender issues, besides keep the Berniebros reined in? I’d like his campaign to ponder its own gender gap, in which men overwhelmingly favor Sanders. Yes, the Vermont senator won women in New Hampshire, 55-45, a blow to Clinton. But he won men 66-32, an 11-point gender gap. Why did two-thirds of men reject Clinton for Sanders? It’s certainly not all sexism, but some of it is. That should give the Sanders team pause when it comes to messaging. Sanders also heads into less-white states where the votes of African-American women, Asian women, and Latinas will matter much more. There is little polling on whether millennial voters of color, particularly women, are #Feelingthebern. He needs to work harder to make sure they do. Finally—and this isn’t about Berniebros—he needs a dose of kindness and humility toward his opponent, and her supporters. As he takes on yet another woman—Vermont Governor Madeline Kunin has written about his tone-deaf but unsuccessful campaign against her—he ought to be a little more sensitive to the tens of millions of women who do support Clinton. (So do the media, which sometimes treat Clinton’s over-45 supporters as an albatross she should shake off rather than an advantage.) Sanders’s self-pitying victory speech Tuesday night cast him as a victim of a Democratic “establishment”—including, as he’s claimed in the past, feminist groups like Planned Parenthood and NARAL Pro-Choice America—that he’ll very much need to become president. He can’t win by only being the candidate of white men and young white women. A little bit of generosity, a dose of share-the-political-warmth, from our first realistic socialist presidential contender could go a long way.